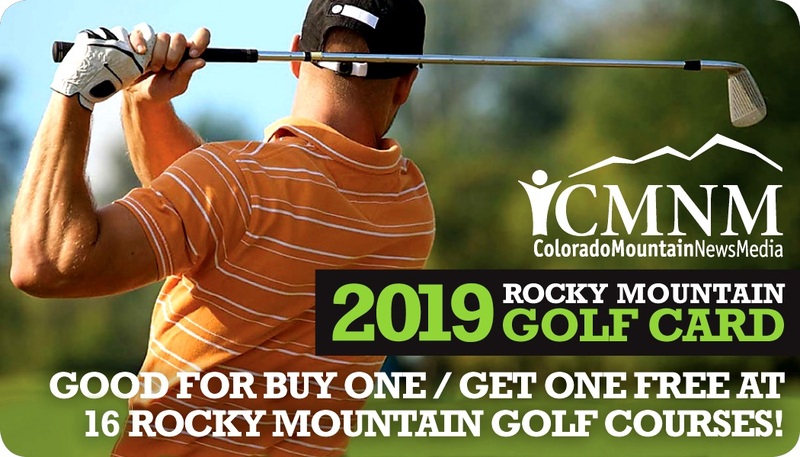 The Rocky Mountain Golf Card offers buy-one-get-one free golf at 16 courses across the resort markets of Colorado's high country. (Some restrictions apply) The card is good for the entire 2019 golf season and offers up to $1,100 in savings for just $99! Free round must be used on the same day at the same time. You must present your Rocky Mountain Golf Card at the time you purchase your round of golf. Free round of golf available for tee times after 10 am Monday - Sunday unless otherwise indicated. Limit one free round/purchase per golf course. Card may not be used in combination with any other offers, discounted rates, leagues, tournaments or for other recurring , pre-organized golfing groups. Free rounds do not include a cart unless otherwise specified by the course. It is the responsibility of the card holders to observe the rules and etiquette of each course and to call ahead for tee times. Colorado Mountain News Media and the Rocky Mountain Golf Card are not responsible for lost or stolen cards. No refunds or replacement cards will be issued. Card expires November 30th, 2019. The Rocky Mountain Golf Card is now just $79 through the end of the season! Enjoy buy one get one golf at 13 regional golf courses with this special card, special 4.12. & 4.13 only. The Rocky Mountain Golf Card is a hard card stock card that folds into the size of a business card. They are small enough to fit in a standard wallet. All cards will be mailed via USPS. Please allow 7 -10 business days for product delivery. HOLIDAY ORDERS MUST BE RECEIVED BY DEC. 12TH, 2018 to assure delivery for Christmas. The 2019 Rocky Mountain Golf Card is on sale now until the cards sell out. Limited number of cards will be sold. The card is a project of Colorado Mountain News Media and includes buy-one-get-one free golf at 16 courses within the high country resort communities. Certain restrictions apply. The card will be valid throughout the 2019 golf season and looks to save golf enthusiasts up to $1,100 in greens fees if used at all 16 courses. See Rockymountaingolfcard.com for a list of courses participating in the 2019 card. This card entitles you to one free round of golf with the purchase of one round of golf. Restrictions apply at some courses and are listed on the card. Free round must be used on the same day at the same time. No raincheck will be issued. You MUST present your Rocky Mountain Golf Card at the time you purchase your round of golf. Free round of golf available for tee times set after 10 am Monday - Sunday, except where otherwise noted. Limit one free round/purchase per golf course. Card may not be used in combination with any other offers, leagues, tournaments or for other recurring, pre-organized golf groups. Free rounds do NOT include a cart unless otherwise specified by a course. It is the responsibility of card holders to observe the rules and etiquette of each course and to call ahead for tee times. The Rocky Mountain Golf Card and Colorado Mountain News Media are not responsible for lost or stolen cards. No refunds or replacement cards will be issued. Card expires November 30th, 2019. The card is transferable. The same person does not need to use it at each course. The Rocky Mountain Golf Card is a foldable hard stock card that is designed to fit into a standard wallet. ALL CARDS WILL BE MAILED OUT VIA USPS. Please allow 7-10 business days for delivery. Holiday deadline for ordering is December 12th!